The wind sometimes howls 80 miles per hour. Drivers often cruise past even faster, some in tractor-trailers, which begin bomblike tremors when they hit potholes. Then there's the steam from the gypsum plant below that can make the clearest day appear thick with fog. But what really keeps Bob Keeler and the 19 men he supervises from dozing on the job as they replace rivets and scrape rust high above the Mystic River is the jetsam flying at high speeds from the passing traffic: beer bottles, mattresses, everything from slop sinks to sofas. "You risk your neck working in live traffic," said Keeler, the maintenance manager of the Tobin Memorial Bridge. "You take your life in your hands every time you go out there." As nature and 80,000 vehicles a day take their toll, Keller's staff does what it can in the ever more costly effort to maintain New England's largest bridge. The stress became visible this month, when inspectors found fissures in a floor beam that required highway officials to ban trucks, buses, and other commercial vehicles from the southbound lanes. The cracks in the 57-year-old cantilever truss bridge, which spans more than 2 miles from Charlestown to Chelsea, have been repaired, and yesterday the third lane on the upper level opened to traffic for the first time since Oct. 12. But the work never stops. The countless fixes and patches on the aging bridge will cost taxpayers $13 million this fiscal year, or about $4 million more than a typical year, because of painting and deck-replacement projects. Officials at the Massachusetts Port Authority, which oversees the Tobin, estimate maintenance costs will rise as much as 10 percent a year as time assaults the 15 concrete piers and 92 steel columns that support the green bridge named for Maurice J. Tobin, a former Boston mayor and governor of Massachusetts. A consulting firm is about one-third through a three-month, foot-by-foot review of the bridge, which outside inspectors conduct every four years and which will require closing of one of the southbound lanes periodically over coming weeks. They discovered the compromised beam and have since found additional deficiencies, characterized by officials as minor and normal for an older bridge. "We haven't found anything else that's of a major consequence," said Sam Sleiman, director of capital programs and environmental affairs at Massport. "What we have found is normal wear and tear." Rusted steel, potholes, electrical problems, and bolts shaken out of place by the vibrating traffic - each beam has three times the number of bolts required, Sleiman says - are commonplace problems for the Tobin. The bridge's maintenance crews spend the year doing everything from replacing the aviation lights atop the bridge to mowing grass at the base of some beams, at least one of which rises from a neighbor's backyard. Unlike spans in fair-weather locales, such as the Golden Gate Bridge in San Francisco, major work on the Tobin must stop during the winter, which makes the bridge far more difficult to maintain. The sand and salt spread across the three lanes of traffic on each level, as well as the pounding the roads take from the plows, corrode the bridge so much that it requires a constant cycle of painting and deck replacement. Massport is near the end of a 15-year, $50 million program to replace the decks, the asphalt, and concrete making up the roads and a $45 million program to scrape, prime, and repaint the bridge, which was initially covered in about 25,000 gallons of lead paint. Peter McDonald, a contractor who oversees 25 painters who dangle from precarious places atop the bridge, said traffic and fog complicate the work of fighting rust. 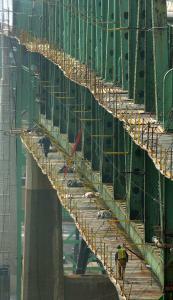 "Everything on the bridge migrates because of the vibration," he said. "Sometimes work has to stop when we can't see." Bridge officials sometimes have to call the gypsum plant to tell it to switch smokestacks or reduce the amount of steam, which can envelop the bridge and make work next to impossible. Between March and November, McDonald's painters have spent seven days a week using a steel abrasive to blast away the old paint, which they vacuum from a contained area. They're in the process of using an airless spray paint to cover the bridge's estimated 225,000 rivets and 50,000 bolts, in all some 45,000 tons of steel. On a recent tour of the bridge, Joe Staub, the Tobin's acting director, pointed at signs of his staff's challenges: rust dripping down several of the main concrete piers, paint flaking off beams, dislodged rivets beside the roadway, pigeons nesting in beams supporting the upper level, and the refuse dumped by passing drivers. "You'd be amazed at all the debris we have," said Staub, who oversees 26 toll collectors, the maintenance crews, and works in an office suspended beneath the bridge that shakes whenever a large vehicle passes overhead. A device above him squawked with the sound of a hawk (to ward off the pigeons) and, in the distance, a truck sent a large boom beneath the lower deck, where inspectors in an attached bucket examined the bottom of the bridge. He said some days feel like combat, when a bad accident occurs, when police chase scofflaws across the bridge or an LNG tanker shuts down all work and traffic. Then he pointed at an obstacle no one on his staff will overcome: the line of vehicles that can back up into Revere. "There's nothing that isn't painful to the commuters," he said. "No one wants to be caught in traffic."